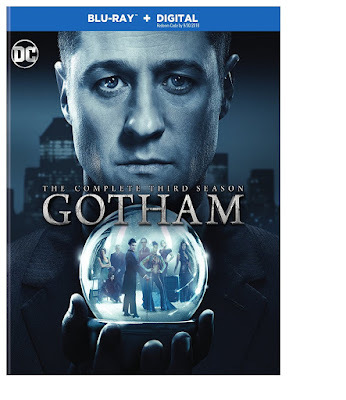 Article first published as Blu-ray Review: 'Gotham - The Complete Third Season' on Blogcritics. Despite the failures of the big screen DC efforts of the past decade, there are some really good shows representing that comic company on the small screen. Gotham is a DC show that sometimes baffles me because it has some really cool elements and can be quite gripping at times, while other arcs are lackluster and plodding. Three years in, it seems like the series is pulling itself together, as I would argue that Gotham – The Complete Third Season has many of the best episodes of the show, and certainly the strongest run when taken all together due to its complexity, the cast becoming more comfortable in their roles, and writers’ ability to still surprise. Gotham‘s third season begins with two major developments: Jim Gordon (Ben McKenzie) is no longer an officer with the Gotham City Police Department, and Penguin (Robin Lord Taylor) and Nygma (Cory Michael Smith) are best friends. The first of those is important because Gordon’s role with the GCPD is a vital part of his identity, and dictates the daily activities of the most central character of the ensemble. The latter makes a difference because those are two very formidable villains, Nygma more so as the season goes on and he becomes The Riddler, so they are in a position to cause much trouble indeed when their forces are combined. These elements also echo a greater trend. The subtitle for the first past of the season is Mad City, and Gotham certainly falls under that descriptor. Penguin is elected mayor early on. The mysterious Court of Owls is seen to be pulling the strings of both sides of the law for their own purposes. Law enforcement is in chaos, unable to contend with the bad guys who seem to keep multiplying. With the metropolitan area under such pressure and conflict, what can be done to right the ship? Well, while the villains are gaining the upper hand, there are a number of signs that things will come around, starting with the subtitle for the end of the season, Heroes Rise. Gordon, as we know he must, does go back to the GCPD. Bruce Wayne (David Mazouz) inches ever closer to becoming Batman, something that seems poised to happen in season four. Lucius Fox (Chris Chalk) plays a larger role in these episodes. That tells me that, as bad as things are, there is help on its way. Gotham is a show with an extremely large cast and a lot of subplots intertwining at once, so it would be impossible to get into everything that happens in season three in this review, even just looking at the lead characters. However, there are a few things worth mentioning about The Complete Third Season. Barbara’s (Erin Richards) growth, furthering her independence, is quite pleasing. This season brings the return of Jerome (Cameron Monaghan), Hugo Strange (BD Wong), and Carmine Falcone (John Doman), who all seem to have plenty of potential left in them. Villain Jervis Tetch (Benedict Samuel, The Walking Dead) would work better as a guest character, rather than artificially keeping him around all year. New, grown-up Ivy (Maggie Geha, Ted 2) is pretty cool, once they started to develop her character in the back half of the season. Chelsea Spack’s reprise is interesting, until she is wasted without resolution. The way Gordon and Lee (Morena Baccarin) are kept apart feels forced. Alexander Siddig (Game of Thrones, Star Trek: Deep Space 9) is pretty awesome, so I’m glad to see him show up in a neat way. It’s a mixed bag, but I’d say it’s more good than bad. Gotham – The Complete Third Season has a pretty good batch of bonus features. There’s a featurette on the Court of Owls, and another on the new villains. Star Ben McKenzie makes his directorial debut this season, so there’s material on that. Deleted scenes are scattered across the four-disc set. The 2016 Comic Con panel is pretty useless after the season has been viewed, and given it’s on the last disc, that’s likely to be when people see it. (This is not a complaint specific to Gotham, as other recent releases have done the same thing, which does not make it better.) In summary, a decent lineup. Gotham – The Complete Third Season is available now on blu-ray, DVD, and digital download.